Portland, Maine (May 9, 2018) – The family that bleeds together, stays together. It isn't exactly warm, fuzzy, wall-hanging material that you'll find overlooking somebody's mantle, but the statement applies to Tampa, Florida-based domestic partners Amanda Gallo and Michael Vizza. Vizza was still training for a bout in Florida when they paid a four-day visit to Maine in the dead of winter for Gallo's showdown with then-undefeated Bailey. It took a while for her to win over the crowd, of course. Many of them were responsible for selecting Bailey as NEF's 2017 rookie of the year. 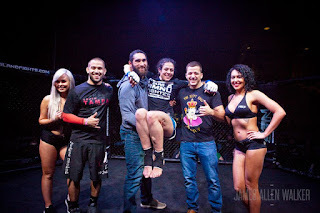 After losing her debut in Thomasville, Georgia, by split decision to a veteran opponent, Gallo balanced the books with a unanimous decision victory at Bailey's expense. “I know she's a black belt in jiu-jitsu, so that will be an interesting challenge,” Gallo said of Genschell. In Gallo's case, women's opponents are hard to find in her corner of the country. The sudden spike of competitiveness in NEF's female ranks could make Maine a semi-regular destination for years to come.